Just because you believe something doesn’t make it true. For example, I can believe I’m a better football player than anyone in the NFL, but that doesn’t mean I am (and I’m not, by the way!). Why is this important? Because there are lots of ideas and theories about how millionaires got their money. And we’ve learned from our recent research that a lot of those ideas are wrong. Flat wrong. For example, our study showed that a lot of people think millionaires inherited their money. People, that’s just not true. Let me explain the secret to their success. Did Millionaires Inherit Their Wealth? We recently released the findings of the largest study of millionaires ever conducted, with 10,000 people participating. We also surveyed the general population, and we found out that 74% of Millennials believe millionaires inherited their money. So do 52% of Baby Boomers. Our study of millionaires blows that theory out of the water. Only 21% of millionaires received any inheritance at all. Just 16% inherited more than $100,000. And get this: only 3% received an inheritance at or above $1 million. Think about that: 74% of Millennials believe millionaires inherited their money, but the vast majority of millionaires didn’t get any inheritance at all, and those who did certainly didn’t get enough to make them millionaires! How Many Americans Receive an Inheritance? If 21% of millionaires inherited their money, how does that measure up to the rest of America? The Federal Reserve asked that question, and guess what their answer was . . . 21%. That’s right. Millionaires and the general population receive inheritances at the exact same rate. 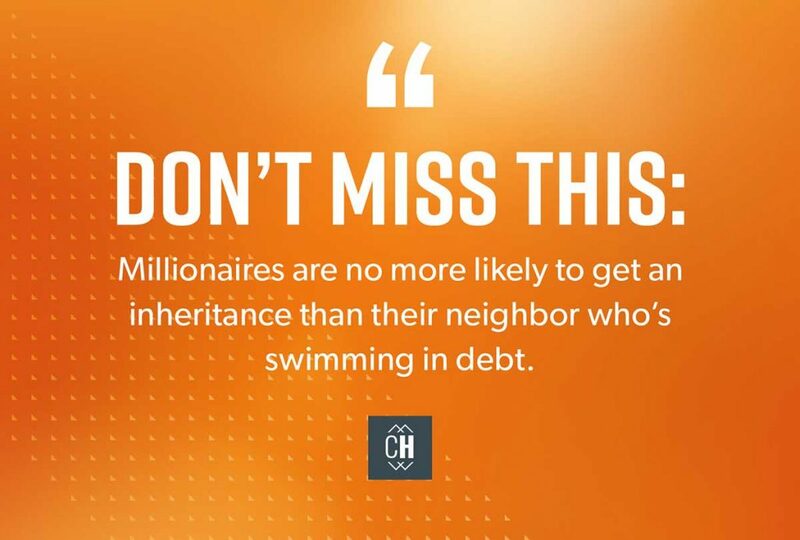 (1) So, don’t miss this: Millionaires are no more likely to get an inheritance than their neighbor who’s swimming in debt. Where Do Millionaires Get Their Money? If only a small percentage of millionaires in our survey received an inheritance, then how did these 10,000 people get their money? Work. Old-fashioned, gritty, roll-up-your-sleeves, get-your-hands-dirty work. We gave the millionaires in our study a list of items that could contribute to someone becoming a millionaire, and then we asked them to rank them. What ranked number one, beating out everything else? Financial discipline. What ranked number two? Saving consistently. Discipline and consistency. These two factors outweigh a high-paying job, inheritance, and luck every time. 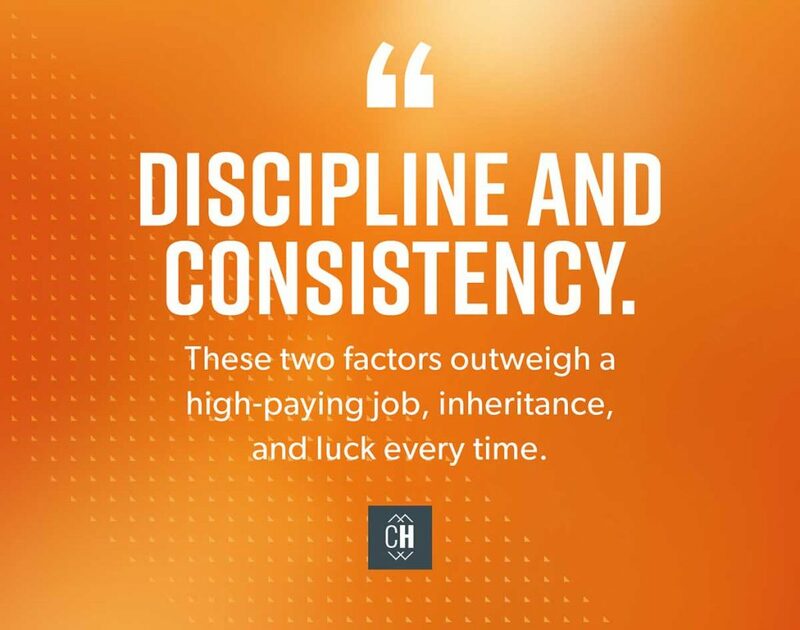 And the good news is, we can all choose discipline and consistency. They aren’t reserved for special or “lucky” people; anyone can commit to being financially disciplined. The problem is that most people don’t want to take the long road. They want instant success. But that’s just a myth. Tori grew up in a lower-middle-class family and was responsible for her own finances at a young age. She never got an allowance and always had to work for every dollar she had. Well, almost every dollar. She remembers her aunt giving her a birthday card for her seventh birthday. When she opened the card, Tori found 10 dimes taped to the inside. It was such a special, significant gift that Tori never spent the money. In fact, she still has that card—dimes included—as one of her most prized possessions. All through high school, Tori had a specific career goal: She wanted to be a CPA. Back then, she says, women weren’t generally working as CPAs. She didn’t let that stop her, though. She completed her degree and started working in accounting right out of college. Her family’s financial background, as well as her accounting education, shaped her approach to money. Because of the money stress she constantly saw in her parents, Tori committed early on that she would become financially independent. From the day she became responsible for her own finances at age 15, she set a goal of having enough money to live comfortably—more comfortably than her parents could have imagined. Throughout her entire career, Tori kept that goal in mind, and it guided all her financial decisions. She never bought anything she couldn’t pay cash for. She worked and saved to put herself through school and to purchase her own home. When her friends bought brand-new cars, she bought five-year-old cars. She never got distracted, and she never stopped saving. Today, she and her husband are retired multi-millionaires and are living the life they’ve dreamed of—and worked for—for decades. Tori knows she’s lived a much different life than most people. As an accountant, she’s seen people waste an unbelievable amount of money. She’s seen every mistake imaginable, watching families lose millions in potential wealth by running after new cars, giant houses, and ridiculous vacations. Tori said everything she’s accomplished is the result of starting early, sticking with it, and the power of compound interest. She knows, even now in retirement, that the decisions she made in her twenties led her directly to where she is today. She’s learned through decades of patience and hard work that consistency pays off—big time. I love Tori’s story, because she’s just like the countless people I’ve met as I’ve traveled across the country. She’s just an ordinary person who determined that she would make her future better than her past. And you can do the same thing. If you read Tori’s story carefully, you can learn from her and start on your own path of building wealth. She invested. She lived on less than she made. She stayed out of debt. She followed her plan and didn’t get distracted by what others were buying and doing. And she did those things for decades. Slow and steady wins the race every time. So, what about you? Are you willing to save for decades? Will you live below your means? Do you want to develop the patience and determination to invest month after month, year after year? If so, then you can reach your wealth goals. You can live the life you want on your terms. If you want to learn more principles and character traits that can help you build wealth, check out my new book, Everyday Millionaires: How Ordinary People Built Extraordinary Wealth—and How You Can Too. You’ll come away informed, encouraged and inspired to make your future better than you could have ever imagined. You don't have to take this financial journey by yourself. An investment pro can help you with your goals.